The Chinese believe that every meal should contain an equal division between grains and starches, and fruits and vegetables. One of the grains they rely on to provide this harmonious dietary balance is noodles. 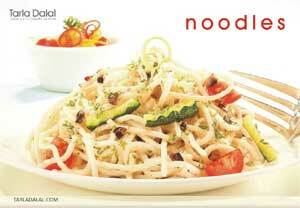 Whether you slurp them, gulp them down, or twirl them on your fork, everyone seems to love noodles. If you thought the noodle selection is restricted to the ready to cook packs you find in the supermarket, this book is the perfect foil to disillusion you. Noodles lend themselves to an amazing collection of recipes so versatile that it looks after your tastes very well indeed. Noodles find themselves in a variety of dishes other than your regular vegetable noodles; this book helps you experience a complete dining experience that is not expensive and full of choices.